Great Lakes NeuroTechnologies understands that clinical validation of new technologies is critical to demonstrating efficacy and safety as well as building product trust. Therefore, we have partnered with world-renowned movement disorder centers and neurologists to conduct clinical studies in several areas such as Parkinson’s disease and Essential tremor. Hundreds of patients have already successfully used our technologies for assessing movement disorders in clinical and home environments. The following highlights a subset of those clinical validation studies. Heldman DA, Urrea-Mendoza E, Lovera LC, Schmerler DA, Garcia X, Mohammad ME, McFarlane MCU, Giuffrida JP, Espay AJ, Fernandez HH. Dustin A. Heldman; Denzil A. Harris; Timothy Felong; Kelly L. Andrzejewski; E. Ray Dorsey; Joseph P. Giuffrida; Barry Goldberg; Michelle A. Burack. IEEE Trans Biomed Eng. 2018 Jan;65(1):159-164. Effect of subthalamic stimulation on distal and proximal upper limb movements in Parkinson’s disease. Tamás G, Kelemen A, Radics P, Valálik I, Heldman D, Klivényi P, Vécsei L, Hidasi E, Halász L, Kis D, Barsi P, Golopencza P, Erőss L.
Brain Res. 2016 Oct 1;1648(Pt A):438-44. doi: 10.1016/j.brainres.2016.08.019. Epub 2016 Aug 16. Heldman, D.A., Pulliam, C.L., Urrea Mendoza, E., Gartner, M., Giuffrida, J.P., Montgomery, E.B., Espay, A.J., and Revilla, F.J.
Neuromodulation: Technology at the Neural Interface, Dec 2015. Conf Proc IEEE Eng Med Biol Soc. 2014. 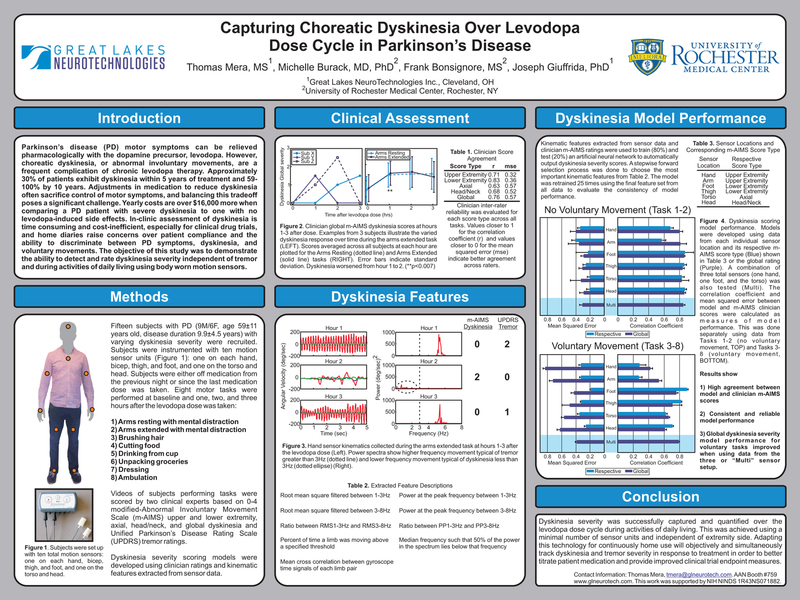 Dyskinesia throughout the levodopa dose cycle has been previously measured in patients with Parkinson’s disease (PD) using a wrist-worn motion sensor during the stationary tasks of arms resting and extended. Quantifying dyskinesia during unconstrained activities poses a unique challenge since these involuntary movements are kinematically similar to voluntary movement. To determine the feasibility of using motion sensors to measure dyskinesia during activities of daily living. Fifteen PD subjects performed scripted activities of daily living while wearing motion sensors on bilateral hands, thighs, and ankles over the course of a levodopa dose cycle. Videos were scored by clinicians using the modified Abnormal Involuntary Movement Scale to rate dyskinesia severity in separate body regions, with the total score used as an overall measure. Kinematic features were extracted from the motion data and algorithms were generated to output severity scores. Movements when subjects were experiencing dyskinesia were less smooth than when they were not experiencing dyskinesia. Dyskinesia scores predicted by the model using all sensors were highly correlated with clinician scores, with a correlation coefficient of 0.86 and normalized root-mean-square-error of 7.4%. Accurate predictions were maintained when two sensors on the most affected side of the body (one on the upper extremity and one on the lower extremity) were used. 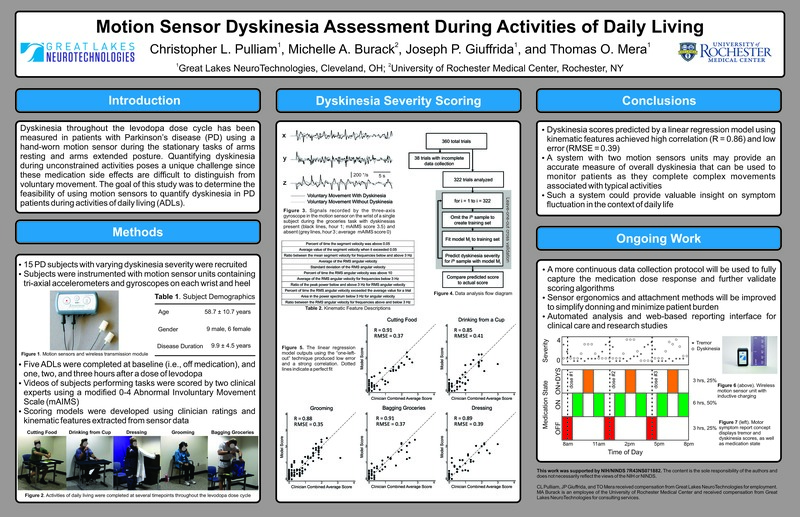 A system with motion sensors may provide an accurate measure of overall dyskinesia that can be used to monitor patients as they complete typical activities, and thus provide insight on symptom fluctuation in the context of daily life. Enhancing the reliability and responsiveness of motor assessments required to demonstrate therapeutic efficacy is a priority for Parkinson’s disease (PD) clinical trials. The objective of this study is to determine the reliability and responsiveness of a portable kinematic system for quantifying PD motor deficits as compared to clinical ratings. Eighteen PD patients with subthalamic nucleus deep-brain stimulation (DBS) performed three tasks for evaluating resting tremor, postural tremor, and finger-tapping speed, amplitude, and rhythm while wearing a wireless motion-sensor unit (Kinesia) on the more-affected index finger. These tasks were repeated three times with DBS turned off and at each of 10 different stimulation amplitudes chosen to yield small changes in treatment response. Each task performance was video-recorded for subsequent clinician rating in blinded, randomized order. Test-retest reliability was calculated as intraclass correlation (ICC) and sensitivity was calculated as minimal detectable change (MDC) for each DBS amplitude. ICCs for Kinesia were significantly higher than those for clinician ratings of finger-tapping speed (p < 0.0001), amplitude (p < 0.0001), and rhythm (p < 0.05), but were not significantly different for evaluations of resting or postural tremor. Similarly, Kinesia scores yielded a lower MDC as compared with clinician scores across all finger-tapping subscores (p < 0.0001), but did not differ significantly for resting and postural tremor. The Kinesia portable kinematic system can provide greater test-retest reliability and sensitivity to change than conventional clinical ratings for measuring bradykinesia, hypokinesia, and dysrhythmia in PD patients. Entrainment, the change or elimination of tremor as patients perform a voluntary rhythmical movement by the unaffected limb, is a key diagnostic hallmark of psychogenic tremor. To evaluate the feasibility of using entrainment as a bedside therapeutic strategy (‘retrainment’) in patients with psychogenic tremor. Ten patients with psychogenic tremor (5 women, mean age, 53.6 ± 12.8 years; mean disease duration 4.3 ± 2.7 years) were asked to participate in a pilot proof-of-concept study aimed at “retraining” their tremor frequency. Retrainment was facilitated by tactile and auditory external cueing and real-time visual feedback on a computer screen. The primary outcome measure was the Tremor subscale of the Rating Scale for Psychogenic Movement Disorders. Tremor improved from 22.2 ± 13.39 to 4.3 ± 5.51 (p = 0.0019) at the end of retrainment. The benefits were maintained for at least 1 week and up to 6 months in 6 patients, with relapses occurring in 4 patients between 2 weeks and 6 months. Three subjects achieved tremor freedom. Tremor retrainment may be an effective short-term treatment strategy in psychogenic tremor. Although blinded evaluations are not feasible, future studies should examine the long-term benefits of tremor retrainment as adjunctive to psychotherapy or specialized physical therapy. Gait and balance disturbances in Parkinson’s disease (PD) can be debilitating and may lead to increased fall risk. Deep brain stimulation (DBS) is a treatment option once therapeutic benefits from medication are limited due to motor fluctuations and dyskinesia. Optimizing DBS parameters for gait and balance can be significantly more challenging than for other PD motor symptoms. Furthermore, inter-rater reliability of the standard clinical PD assessment scale, Unified Parkinson’s Disease Rating Scale (UPDRS), may introduce bias and washout important features of gait and balance that may respond differently to PD therapies. Study objectives were to evaluate clinician UPDRS gait and balance scoring inter-rater reliability, UPDRS sensitivity to different aspects of gait and balance, and how kinematic features extracted from motion sensor data respond to stimulation. Forty-two subjects diagnosed with PD were recruited with varying degrees of gait and balance impairment. All subjects had been prescribed dopaminergic medication, and 20 subjects had previously undergone DBS surgery. Subjects performed seven items of the gait and balance subset of the UPDRS while wearing motion sensors on the sternum and each heel and thigh. Inter-rater reliability varied by UPDRS item. Correlation coefficients between at least one kinematic feature and corresponding UPDRS scores were greater than 0.75 for six of the seven items. Kinematic features improved (p<0.05) from DBS-OFF to DBS-ON for three UPDRS items. Despite achieving high correlations with the UPDRS, evaluating individual kinematic features may help address inter-rater reliability issues and rater bias associated with focusing on different aspects of a motor task. To develop a rapid cadence cycling intervention (active-assisted cycling [AAC]) using a motorized bike and to examine physiological perimeters during these sessions in individuals with Parkinson’s disease (PD). A secondary goal was to examine whether a single session of AAC at a high cadence would promote improvements in tremor and bradykinesia similar to the on medication state. Before-after pilot trial with cross-over. Individuals with idiopathic PD (N=10, age 45-74y) in Hoehn and Yahr stages 1 to 3. Heart rate, pedaling power, and rating of perceived exertion were recorded before, during, and after a bout of AAC. Functional assessments included tremor score during resting, postural, and kinetic tremor. This AAC paradigm was well tolerated by individuals with PD without excessive fatigue, and most participants showed improvements in tremor and bradykinesia immediately after a single bout of cycling. This paradigm could be used to examine changes in motor function in individuals with PD after bouts of high-intensity exercise. The objective was to capture levodopa-induced dyskinesia (LID) in patients with Parkinson’s disease (PD) using body-worn motion sensors. Dopaminergic treatment in PD can induce abnormal involuntary movements, including choreatic dyskinesia (brief, rapid, irregular movements). Adjustments in medication to reduce LID often sacrifice control of motor symptoms, and balancing this tradeoff poses a significant challenge for management of advanced PD. Fifteen PD subjects with known LID were recruited and instructed to perform two stationary motor tasks while wearing a compact wireless motion sensor unit positioned on each hand over the course of a levodopa dose cycle. Videos of subjects performing the motor tasks were later scored by expert clinicians to assess global dyskinesia using the modified Abnormal Involuntary Rating Scale (m-AIMS). Kinematic features were extracted from motion data in different frequency bands (1-3Hz and 3-8Hz) to quantify LID severity and to distinguish between LID and PD tremor. Receiver operator characteristic analysis was used to determine thresholds for individual features to detect the presence of LID. A sensitivity of 0.73 and specificity of 1.00 were achieved. A neural network was also trained to output dyskinesia severity on a 0 to 4 scale, similar to the m-AIMS. The model generalized well to new data (coefficient of determination= 0.85 and mean squared error= 0.3). This study demonstrated that hand-worn motion sensors can be used to assess global dyskinesia severity independent of PD tremor over the levodopa dose cycle. To assess temporal amplitude variability in patients with essential tremor (ET). Patients who satisfied the diagnostic criteria for probable or definite ET were enrolled in the study. Each enrolled patient was first rated using the essential tremor rating assessment scale (TETRAS). Postural and kinetic tremors of the arms were then measured using a quantitative motor assessment system (QMAS) starting at 8:00 AM (T0-baseline) every 2 h for 6 h. Subjects were videotaped performing the tasks. Single subjects consecutively performed each assessment twice during every time-interval. At the end of the study, videos were randomized and blindly rated using TETRAS. Twelve ET subjects were enrolled. QMAS and video scores were directly correlated with high test-retest reliability for each time-interval. Furthermore, the QMAS scores at T0 significantly correlated with in-person rated TETRAS scores as well as with subsequent time-intervals instrumental scores. No significant differences were detected between time-intervals QMAS average measurements using ANOVA. There was a maximal 23% absolute variation in tremor amplitude from baseline as determined by the QMAS. Test for equality of variance showed high measurement variability for subjects with high QMAS scores at T0 and throughout the 6 h of assessment. Baseline measures are predictive of tremor amplitude at subsequent assessments during the day. High amplitude tremor is associated with high intra-assessment variability. Functional motor impairment caused by Parkinson’s disease and other movement disorders is currently measured with rating scales such as the Unified Parkinson’s Disease Rating Scale (UPDRS). These are typically comprised of a series of simple tasks that are visually scored by a trained rater. We developed a method to objectively quantify three upper extremity motor tasks directly with a wearable inertial sensor. Specifically, we used triaxial gyroscopes and adaptive filters to quantify how predictable and regular the signals were. We found that simply using the normalized mean squared error (NMSE) as a test statistic permitted us to distinguish between subjects with and without Parkinson’s disease who were matched for age, height, and weight. A forward linear predictor based on the Kalman filter was able to attain areas under the curve (AUC) in receiver operator characteristic (ROC) curves in the range of 0.76 to 0.83. Further studies and development are warranted. This technology has the potential to more accurately measure the motor signs of Parkinson’s disease. This may reduce statistical bias and variability of rating scales, which could lead to trials with fewer subjects, less cost, and shorter duration. Patients with Parkinson’s disease (PD) receive therapies aimed at addressing a diverse range of motor symptoms. 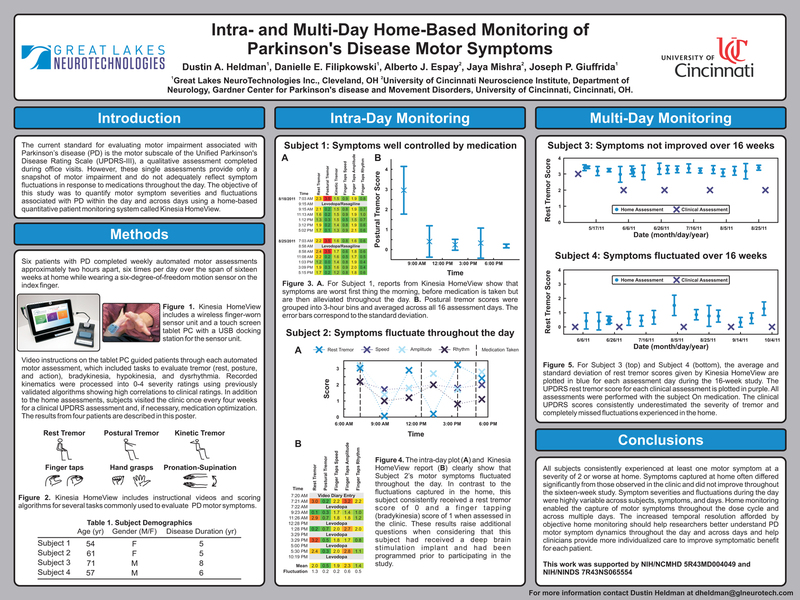 Motor complications in the form of symptom fluctuations and dyskinesias that commonly occur with chronic PD medication use may not be effectively captured by Unified Parkinson’s Disease Rating Scale (UPDRS) assessments performed in the clinic. Therefore, home monitoring may be a viable adjunct tool to provide insight into PD motor symptom response to treatment. In this pilot study, we sought to evaluate the feasibility of capturing PD motor symptoms at home using a computer-based assessment system. Ten subjects diagnosed with idiopathic PD used the system at home and ten non-PD control subjects used the system in a laboratory. The Kinesia system consists of a wireless finger-worn motion sensor and a laptop computer with software for automated tremor and bradykinesia severity score assessments. Data from control subjects were used to develop compliance algorithms for rejecting motor tasks performed incorrectly. These algorithms were then applied to data collected from the PD subjects who used the Kinesia system at home to complete motor exams 3-6 times per day over 3-6 days. Motor tasks not rejected by the compliance algorithms were further processed for symptom severity. PD subjects successfully completed motor assessments at home, with approximately 97% of all motor task data files (1222/1260) accepted. These findings suggest that objective home monitoring of PD motor fluctuations is feasible. Although movement impairment in Parkinson’s disease includes slowness (bradykinesia), decreased amplitude (hypokinesia), and dysrhythmia, clinicians are instructed to rate them in a combined 0-4 severity scale using the Unified Parkinson’s Disease Rating Scale motor subscale. The objective was to evaluate whether bradykinesia, hypokinesia, and dysrhythmia are associated with differential motor impairment and response to dopaminergic medications in patients with Parkinson’s disease. Eighty five Parkinson’s disease patients performed finger-tapping (item 23), hand-grasping (item 24), and pronation-supination (item 25) tasks OFF and ON medication while wearing motion sensors on the most affected hand. Speed, amplitude, and rhythm were rated using the Modified Bradykinesia Rating Scale. Quantitative variables representing speed (root mean square angular velocity), amplitude (excursion angle), and rhythm (coefficient of variation) were extracted from kinematic data. Fatigue was measured as decrements in speed and amplitude during the last 5 seconds compared with the first 5 seconds of movement. Amplitude impairments were worse and more prevalent than speed or rhythm impairments across all tasks (P < .001); however, in the ON state, speed scores improved exclusively by clinical (P < 10(-6) ) and predominantly by quantitative (P < .05) measures. Motor scores from OFF to ON improved in subjects who were strictly bradykinetic (P < .01) and both bradykinetic and hypokinetic (P < 10(-6) ), but not in those strictly hypokinetic. Fatigue in speed and amplitude was not improved by medication. Hypokinesia is more prevalent than bradykinesia, but dopaminergic medications predominantly improve the latter. Parkinson’s disease patients may show different degrees of impairment in these movement components, which deserve separate measurement in research studies. Previous studies have shown that single bouts of high-rate active cycling (> 80 rpm) improve upper extremity motor function in individuals with Parkinson’s disease (PD). It is unknown if passive leg cycling produces a similar effect on upper extremity function. This article examines whether passive leg cycling can promote immediate changes in upper tremor and bradykinesia in PD and if pedaling rates have variable effects. Twenty individuals with mild-to-moderate idiopathic PD completed 4 sessions, with each session taking place 1 week apart. In the second to fourth sessions, a motorized bicycle was set to passively rotate the subjects’ legs at rates of 60, 70, or 80 rpm for 30 minutes. Quantitative upper extremity motor assessments were completed immediately before and after each session. Passive leg cycling was shown to reduce tremor and bradykinesia in PD. However, the rate of passive cycling did not affect the degree of improvement in bradykinesia or tremor. These findings suggest that lower extremity passive cycling can promote changes in upper extremity motor function in individuals with PD. D. Heldman, J. Giuffrida, R. Chen, M. Payne, F. Mazzella, A. Duker, A. Sahay, S. Kim, F. Revilla, A. Espay. Bradykinesia encompasses slowness, decreased movement amplitude, and dysrhythmia. Unified Parkinson’s Disease Rating Scale-based bradykinesia-related items require that clinicians condense abnormalities in speed, amplitude, fatiguing, hesitations, and arrests into a single score. The objective of this study was to evaluate the reliability of a modified bradykinesia rating scale, which separately assesses speed, amplitude, and rhythm and its correlation with kinematic measures from motion sensors. Fifty patients with Parkinson’s disease performed Unified Parkinson’s Disease Rating Scale-directed finger tapping, hand grasping, and pronation-supination while wearing motion sensors. Videos were rated blindly and independently by 4 clinicians. The modified bradykinesia rating scale and Unified Parkinson’s Disease Rating Scale demonstrated similar inter- and intrarater reliability. Raters placed greater weight on amplitude than on speed or rhythm when assigning a Unified Parkinson’s Disease Rating Scale score. Modified bradykinesia rating scale scores for speed, amplitude, and rhythm correlated highly with quantitative kinematic variables. The modified bradykinesia rating scale separately captures bradykinesia components with interrater and intrarater reliability similar to that of the Unified Parkinson’s Disease Rating Scale. Kinematic sensors can accurately quantify speed, amplitude, and rhythm to aid in the development and evaluation of novel therapies in Parkinson’s disease. Essential tremor (ET), characterized primarily by postural and kinetic tremor, is typically measured in the clinic with subjective tremor rating scales. These ratings are often used to adjust medications and assess efficacy in clinical trials. However, tremor ratings require the presence of a clinician and do not necessarily capture tremor fluctuations throughout the day during activities of daily living (ADL). To evaluate the ability of motion sensors to discriminate tremor from voluntary posture and motion, classify tremor as postural or kinetic, and rate tremor severity during standardized tasks and non-standardized activities of daily living. Ten subjects with ET wore motion sensors on the index finger and performed standardized motor tasks from the Washington Heights-Inwood Genetic Study of Essential Tremor (WHIGET) tremor rating scale (wTRS) and non-standardized ADL tasks. Four movement disorder specialists independently rated video segments of the standardized tasks but not the ADL tasks. Quantitative features were extracted from the motion sensors and used to develop mathematical models for predicting rating scores from kinematic data. The quantitative motion features were highly correlated with wTRS ratings for postural (r = 0.90) and kinetic (r = 0.80) tremors. Mathematical models produced tremor ratings that correlated strongly with clinician ratings of the wTRS tasks (mean r = 0.80) and also produced ADL task ratings that correlated well with the most recent clinician wTRS ratings (mean r = 0.72). Recordings from motion sensors can be used to classify tremor as postural or kinetic and quantify tremor severity during both standardized and non-standardized activities. Parkinson’s disease (PD) is a neurodegenerative disorder characterized by motor symptoms including tremor and bradykinesia (slowness of movement). Drug treatment, although capable of controlling these symptoms over a number of years, becomes less effective as the disease progresses and leads to motor complications such as drug-induced dyskinesia (involuntary abnormal movements). Deep brain stimulation (DBS) provides an alternative means of controlling motor symptoms in these patients, and while DBS has been effective in improving motor symptoms, these improvements are largely based on accurate placement of the lead and the ability of medical personnel to adequately program the DBS device following implantation. While guidelines exist for DBS programming, selection of stimulation parameters and patient outcome is greatly dependent on subjective clinical assessments and the experience of the medical personnel performing the programming. The aim of this project was to assess the feasibility of using a quantitative and objective approach to programming. Two subjects underwent standard procedures for DBS programming while wearing a small, compact motion sensor. Kinematic data were collected from subjects as they completed motor tasks to evaluate DBS efficacy. Quantitative variables characterizing tremor and bradykinesia were related to stimulation parameters. Results indicated different stimulation settings might be required for optimal improvement of different motor symptoms. A standardized method of programming DBS parameters utilizing motion analysis may provide an objective method of assessment that the programmer can use to better identify stimulation parameters to achieve optimal improvement across multiple motor symptoms. The primary aim of this study was to determine whether scores on The Essential Tremor Rating Assessment Scale (TETRAS) correlate with quantitative assessments using the Kinesia™ (CleveMed) system in patients with essential tremor (ET). Patients sequentially evaluated and diagnosed with ET at the Parkinson’s Disease Center and Movement Disorders Clinic, Baylor College of Medicine were enrolled in the study. The Kinesia portable device was attached to the wrist and subjects were instructed to hold their arms in an outstretched position and then touch their nose while data were wirelessly transmitted to a computer. Subjects were rated on the arm where the system was placed using specific TETRAS items. A linear regression model was constructed for each task using the logarithmic values of both clinical scores and objective motion data parameters to compute a Kinesia score. Twenty subjects underwent complete clinical TETRAS and Kinesia quantitative assessments. TETRAS clinical scores significantly correlated with predicted Kinesia quantitative variables for postural (r = 0.738; P < 0.001) and kinetic (r = 0.57; P = 0.009) tremor. We conclude that the Kinesia system may, therefore, have a utility in quantitative assessments of ET when combined with standard clinical assessment. An electromyographical analysis (EMG) of knee muscle activation patterns and time delays has rarely been discussed in the literature. The purpose of this study was to compare the activation time and EMG amplitude of the dominant vastus medialis and medial hamstring muscles during stair climbing. Fifteen male and 18 female subjects participated in this study. The subjects were asked to ascend and descend 14 steps, five times. There was a significant time delay difference between genders during stair climbing (F=8.37, p=0.008). The female subjects demonstrated longer time delays while descending the steps. In addition, the female subjects demonstrated significantly lower normalized EMG amplitude during down stair climbing (F=5.77, p=0.025) while the male subjects demonstrated higher normalized EMG amplitude for the vastus medialis muscle while descending the steps. These results suggest that female subjects possess an increased risk factor for knee injuries during down stair climbing due to muscle activation delays with decreased vastus medialis muscle activity. The objective was to design, build, and assess Kinesia, a wireless system for automated assessment of Parkinson’s disease (PD) tremor. The current standard in evaluating PD is the Unified Parkinson’s Disease Rating Scale (UPDRS), a qualitative ranking system typically completed during an office visit. Kinesia integrates accelerometers and gyroscopes in a compact patient-worn unit to capture kinematic movement disorder features. Objectively quantifying PD manifestations with increased time resolution should aid in evaluating efficacy of treatment protocols and improve patient management. In this study, PD subjects performed the tremor subset of the UPDRS motor section while wearing Kinesia. Quantitative kinematic features were processed and highly correlated to clinician scores for rest tremor (r(2) = 0.89), postural tremor (r(2) = 0.90), and kinetic tremor (r(2) = 0.69). The quantitative features were used to develop a mathematical model that predicted tremor severity scores for new data with low errors. Finally, PD subjects indicated high clinical acceptance. S. Isaacson, B. Boroojerdi, K. Klos, S. Carson, M. Markowitz, D. Heldman, M. Phillips, D. Terricabras, F. Woltering, D. Truong. Movement Disorders Society Annual Meeting, 2018, Hong Kong. R. Pahwa, R. Dorsey, I. Pan, S. van Norman, T. Marshall, D. Heldman, Y. Jalundhwala. A. Hadley, E. Urrea-Mendoza, N. Mennucci, C. Zimmerman, J. Giuffrida, Z. Mari, M. Burack, I. Itin, F. Revilla, D. Heldman. Reliability and responsiveness of in-clinic and at-home app-based bradykinesia assessment. Heldman, D.A., Urrea Mendoza, E, Lovera, L.C., Schmerler, D.A., Giuffrida, J.P., Espay, A. J., Garcia, J.X.O., Mohammad, M.E., McFarlane, M.C.U., Fernandez, H.H. Movement Disorders Society Annual Meeting, 2016, Berlin, Germany. Wearable sensors and decision algorithms for advanced therapy referral in Parkinson’s disease. Heldman, D.A., Giuffrida, J.P., Cubo, E.
Heldman, DA., Giuffrida, J.P., Cubo, E.
L. Giselle Aguilar, M.D.,J. Giuffrida, Ph.D., D. Heldman, Ph.D., Joseph Jankovic, M.D.